GUEST BLOG: Journalist Ian Neubauer refers to travel as the ‘university of life’. This is a university campus that has taken him from exotic Cambodia to the world’s largest sand island, Fraser Island. Ian recounts his adventures on his website and Balinese-based FRV Travel recently published his Fraser Island story, which we’d like to share with you in this forum. Buckle up, it’s one heck of a ride. 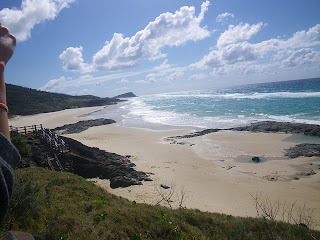 Fraser Island's famous 75-Mile Beach. In 1991, my father took the family to Fraser Island, the largest sand island in the world. Twenty years later I’m heading to Fraser again, this time with my eight-year-old nephew on his very first visit to the 123km-long stretch of land sculptured by wind, waves and rain into what scientists describe as an ecological freak of nature. It’s a 300km drive to Hervey Bay, where a motorised catamaran takes us across the Great Sandy Strait, a nursing ground for dugong, dolphins and humpback whales, and a resting place for an estimated 40,000 trans-equatorial shorebirds that migrate up and down the coastline every year. Half an hour later we arrive at Kingfisher Bay Resort, an eco-property nestled behind a maze of salt-water ponds with three pools and all the trappings of a four-star resort, an ideal place to unwind after a long day on the road, and after checking into our room, we make a beeline for the beach. Fraser is a mecca for 4WD enthusiasts. 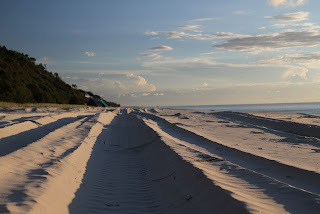 There are virtually no paved roads on Fraser Island, so a four-wheel drive vehicle is the only way to get around and for those on limited budgets or averse to difficult driving conditions, organised tours (or check out the Cool Dingo tours for 18-35s) present a suitable alternative. We set out from Kingfisher in an all-terrain minibus with a crew of 24 Australian and European holidaymakers and in a minute we’re crawling up a steep sandy track, immersed in sunlit woodlands spotted with bristling banksia pods. Our first stop is Lake McKenzie, the jewel of Fraser’s network of 100-plus freshwater lakes. Fed by a massive underground water table, Fraser’s lakes are amongst the cleanest in the world. Some are honey- and tea-coloured, others emerald green or red-brown, all of them ringed by sandy white beaches. The water coalesces into a dozen shades of blue and is warm enough to swim in all year around. Wading in the clean waters. A 1,000-year-old satinay tree: 4W Driving at Eurong Beach. The tour continues and our guide regales us again, this time with the history of logging on the island. Trees were felled on Fraser until 1991 — the year it was nominated for World Heritage listing. The most sought-after species was the satinay tree, prized for its striped bark that’s resistant to corrosion. Satinay was used to rebuild the London Docks after the Blitz and 20,000 were shipped to Egypt to prop up the Suez Canal. Welcome to Fraser Island International Airport. Our next stop is Central Station, a former logging camp now occupied by Queensland Parks and Wildlife Service. A walking track leads into a gully called Wanggoolba Creek, home to some of the oldest rainforests on the face of the planet. We see prehistoric ten-metre-wide king ferns and a 1,000-year-old satinay that reaches 60 metres into the sky. Broccoli-like epiphytes cling to towering hoop pines next to brush box trees being strangled by parasitic fig vines. The next leg of the trip takes us along Seventy-Five Mile Beach, identified on state maps as a bona fide highway. Police have been known to lay speed traps here and subject drivers to random breath tests during peak periods. Vehicles must also give way to small aeroplanes that land on the beach, like the propeller-powered eight-seater that takes us on a short joyflight. It’s our last day at Fraser and we’ve been invited to sail the Great Sandy Strait on a 10-metre catamaran. The Shayla is a purpose-built whale-watching boat that can drift within an arm’s length of frolicking humpbacks. Skipper Brent Milne guarantees whale sightings between August and November, when humpbacks stop for a break on the way back to Antarctica. It’s unlikely we’ll see the mammals today, though conditions are perfect for a leisurely sail. It’s the middle of winter but a pleasant 22 degrees, the sun is shining and there’s but a touch of wind. There is nothing to do but sit back and chill as the vessel cuts along water still as a lagoon. We bypass Little Woody Island, where a quarantine station and little-known leper colony once stood. White-bellied sea eagles kite around tiny Duck Island as a pelican lands on its stony beach. Fraser and surrounds boast 354 species of birds, including honeyeaters, osprey and noisy cockatoos. This story was originally published by RFV Travel.